Two days later, I received this email from YES 4G. 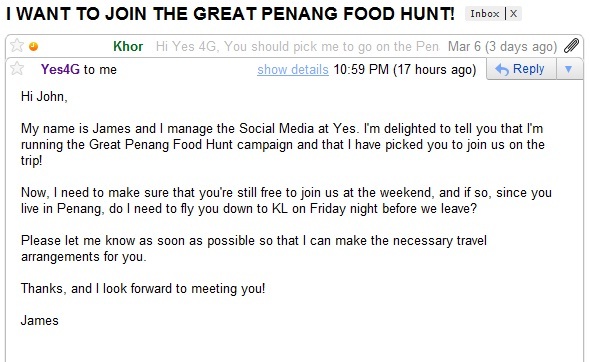 Invitation Email from YES 4G for the Great Penang Food Hunt. Hooray!!! Still remember the Law of Attraction? I really believe in this especially prayers. It really helps. 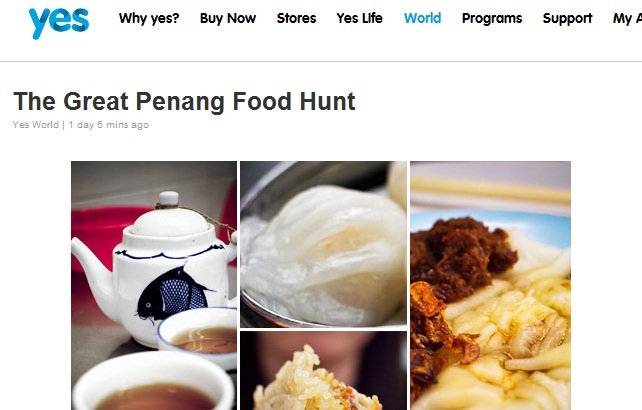 I have been invited to join the YES 4G Great Penang Food Hunt. And YTL YES 4G is so nice to fly me down to KL this Friday night and let me stay in Vistana Hotel a night for free before joining them on a road trip from KL to Penang. That’s so cool of them! YTL rocks! So, remember to come back to my blog this March 12 2011 for my updates on my experience with YES 4G. We will be given a YES Huddle and YES 4G to blog, tweet or Facebook during our road trip. Stay tuned! Next story iOS 4.3 launching on March 10, 2011? Previous story Planning to get iPad 2 in Japan this coming March 25th 2011?